Microsoft recently started rolling out Windows 10 Insider Preview Build 17618 for Windows 10 Insiders who have opted into Skip Ahead. The latest build reintroduces the ‘Sets’ feature which first debuted last year but didn’t make the cut for the RS4 update. Support for desktop (Win32) apps. 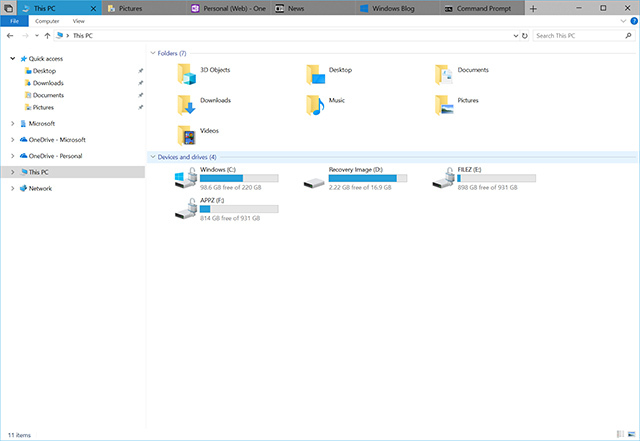 Sets now supports File Explorer, Notepad, Command Prompt, and PowerShell. Ability to launch apps from the new tab page by typing in the app name. UWP apps are launched in the same window replacing the new tab page. Tab UI in Sets now shows icons including website favicons and app icons. While restoring projects Windows 10 will not prompt users to restore related apps and webpages. The Timeline will show when a project has multiple activites associated with it. Ctrl+Win+Tab – switch to next tab. Ctrl+Win+Shift+Tab – switch to previous tab. Ctrl+Win+T – open a new tab. Ctrl+Win+W – close current tab. Tab drag-and-drop does not work for re-ordering tabs. Users can’t drag a tab to join another window. When launching a supported desktop (Win32) app from a tabbed window, it launched a new window instead of auto-grouping to the existing window. Users might notice some flashes while switching between tabs within a Set. If the display scaling is higher than 100%, using touch to interact with the Sets title bar won’t work. The company is working to fix the aforementioned issues and is expected to release them in subsequent RS5 updates. Users also have the ability to enable or disable Sets from Setting>System>Multitasking.